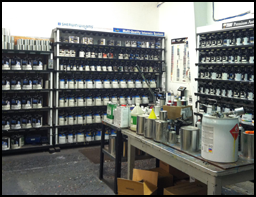 Our full service Paint Department is your one stop shop for all things related to automotive painting, refinishing or manufacturing needs. Automotive Machine, Inc. carries a wide line of Sherwin-Williams Automotive Finishes – the number one name in vehicle refinishing. We can use the spectrophotometer to get the exact paint code for your existing paint, or we can custom mix your favorite color using our extensive line of Sherwin-Williams products. You can buy it by the gallon, ½ gallon, quart, pint, ½ and ¼ pint, sprayable, non-sprayable or have it pumped into an aerosol can. Genesis® is a complete solution for your fleet refinishing or manufacturing needs. Premium Acrylic Polyurethane Topcoat System for OE Manufacturing, Sign Manufacturing, and Fleet Refinish Applications. Dimension® is a low cost high quality coatings system for use in facilities specializing in high volume cosmetic repair or fleet refinishes. Dimension® is also a great solution for manufacturers seeking a quality finish. Dimension® is available as a 1K or 2 K single-stage and base/clear system with VOC levels to meet all rules in the U.S. or Canada. Planet Color® Custom Paints and Finishes is a program which features combinations of highly reflective additives to create new finishes that are dimensional, color shifting, iridescent and extremely brilliant. 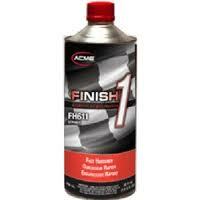 Finish 1™ - Finish 1 is a high performing 3.5 VOC Acrylic Enamel offering excellent gloss and metallic control. ULTRA 7000® Basecoat is an easy-to-apply, fast-drying basecoat that uses unique state of the art resin technology. Advanced Industrial Coatings™ (AIC) is a value primer and topcoat system ideal for various market applications such as construction equipment, trailers, tools, office equipment and miscellaneous metal applications. The AIC intermix system consists of 15 toners, two hardeners for the Acrylic Urethane topcoat a 2.8 VOC and a 3.5 VOC, as well an optional hardener for the Acrylic Enamel topcoat system. For more information about our automotive paint selection, please contact us today.